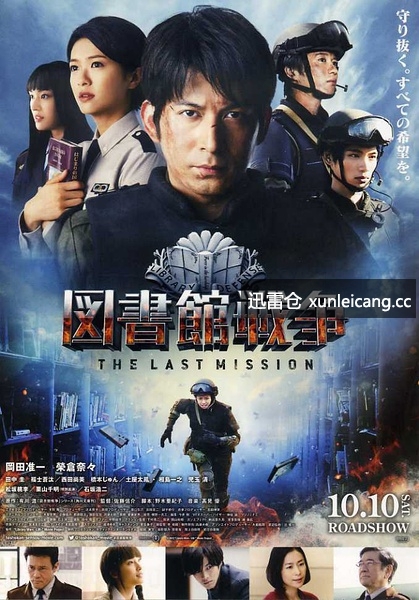 Cast: Okada Junichi, Eikura Nana, Tanaka Kei, Fukushi Sota, Matsuzaka Tori and Kuriyama Chiaki. The sequel continues after the special. Kasahara Iku (Eikura Nana) has figured out that Dojo Atsushi (Okada Junichi) is the man who saved her favorite book and her first love. Unable to confess her love, she tries not to act different around him; but when one of her coworkers decides to burn some confiscated book she is framed for it, and in order to save Dojos reputation she takes the blame. Compared to the first one I liked this one a bit better, but it was no less to the first one. For some reason when you watch it you don’t think about how absurd the ‘wars’ are, and yet when you have to explain it; you kind of face palm yourself. The movie is so great, and I love that it isn’t a movie about people hating other people, rather it focuses on the issue such a free will and thought. Though there is the usual villain, and the ‘us’ against ‘them’ vibe flowing around. As the climax goes this movie nails it, as even I was pretty shocked when I understood what was happening – so that is quite the achievement. I absolutely adore the lead couple: the fact that she is taller than him, and that he has to look up to meet her eyes *amazed* And for some reason you don’t really feel the age gap at all… so great acting! To be fair the movie has a lot of thin layer of missing substance, but they actually make up for it by giving the characters such great chemistry and personalities. So would I recommend this movie? Yes, I would. But I believe people should watch the first one – just to get the entire picture, and be a bit loose on the entire ‘war’ thing.